The Revolt DVD series is a five-session interactive resource for youth presented by Josh McDowell that will help teenagers discover the true source of strength, happiness and meaning in life. Comes with an A4 leader's guide that contains reproducible handouts. The five session topics are: 1. Don't be duped 2. Happiness: created or discovered? 3. The time test - is Christ for real? 4. The same ol' life: not worth living 5. Transformation at the cross. 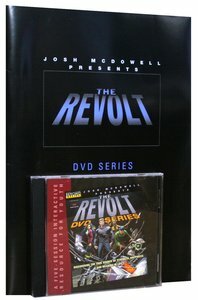 :The Revolt DVD series is a five-session interactive resource for youth presented by Josh McDowell that will help teenagers discover the true source of strength, happiness and meaning in life. Comes with an A4 leader's guide that contains reproducible handouts. The five session topics are: 1. Don't be duped 2. Happiness: created or discovered? 3. The time test - is Christ for real? 4. The same ol' life: not worth living 5. Transformation at the cross.